When I was a brand new mom with a young toddler, I was all about homeschooling. I wanted to dive in immediately. I didn’t want to miss a minute or end up with a child who was “behind!” I knew she would love learning and there was so much out there and…gosh…it was time! Everyone else was sending their kids to preschool and bragging about how many letters and numbers they knew and if they were learning to write their names. I needed to start homeschooling! My oldest child is 9 now. My fifth child is almost 2. I’ve “been there, done that” with the toddler/preschool years a few times now. And I’ve learned…there’s no point in pushing it in those early years. There really isn’t. Mama, please just don’t do it. Please. When my oldest was 2, yes — I tried to “homeschool” her. Well, kind of. I didn’t buy curriculum, but I did sit down and try to ‘teach’ her things here and there. It was frustrating. She wasn’t interested, and my baby needed me. Even when she was 4, I’d try. I’d have a sit down lesson prepared, with worksheets and a white board and a game. My 2-year-old would mess with stuff, and my baby would want to sit in the center of it all. My 4-year-old would fight me and argue and not want to do any of what I had planned. It was all quickly abandoned. Mamas, there is no benefit to pushing academics on your toddlers and preschoolers. None. There is no value in trying to make a child who isn’t ready learn letters, or numbers, or writing skills, or anything else. None at all! Yes, I know, it seems counter-intuitive. But it’s not. Kids at this age are supposed to be exploring the world around them. They are supposed to be jumping, running, and moving, to gain a sense of their bodies in space. Experimenting with different materials (like mixing dirt and water to see the mud they make!) to figure out how it all works. They learn best in a hands-on way, being creative and solving problems. If they’re sitting at desks and being asked to learn sight words, recite the alphabet, or do math problems, they’re missing out on opportunities to do these things. And, yes, it seriously matters in the long run. Basically all kids will learn to read, write, and do math at some point. They may naturally do it at 4, or they may do it at 9 or 10. Most will do it somewhere in between. But they will get there. Unfortunately, we often train our kids not to be curious, creative, or solve problems very well. These are skills a lot of adults are truly lacking. Skills that all children inherently have, but lose over time…because we teach them to sit down, be quiet, and do what they’re told, exactly how they’re told. Mama, your job in these young years is to foster that spark of creativity, that drive to learn, that desire to test and play and enjoy. There will be plenty of time later for sit-down lessons, focusing on reading and writing and math, and other academic pursuits. Although frankly it isn’t that necessary even later, either — at least not until they ask for it. But I Want to Homeschool My Toddler! Relax. You’re not actually “homeschooling” anyway. Life learning, perhaps. That happens from birth. But you’re really not “schooling” your child yet, and you don’t need to. I get it, though. You want to enjoy your toddler, do things with him/her, and have adventures. And there are things you can do with your toddler that are more age-appropriate than sit-down academic lessons! Do art — paint, clay, crayons, etc. Do crafts — make hats, holiday ornaments, color eggs, etc. Really, just explore the world! Your child will learn so much from these things at a young age. There is no need to force academic subjects yet. Your child will learn science from experimenting with mud and water, or from meeting interesting critters outside. She’ll learn math by helping you count items you’re buying or measuring items to dump in your muffins. He’ll learn reading as you read together (in books or as you point out signs around you). Learning in the early years is so easy that as long as you are hands-on with your child — and honestly, usually even if you’re not — your child will learn readily. You basically can’t stop a child from learning! You’re doing fine, mamas. Your child is meant to explore the world and learn naturally. Pay no attention to the people who are going nuts about wanting “baby enrichment” classes and trying to give their babies an edge — those are not proven to help and are really not developmentally appropriate (and honestly so ridiculous!). Your child will get there. S/he will reach school age, and want to learn, and it will come before you know it. My third child will be 6 this summer and officially school aged, and my fourth will be 5 in the middle of next school year. It comes FAST. So enjoy the early years while you have them, and PLAY! Later on, you’ll be glad you did! If you’re not the creative type and are looking for “something” to do with your little ones, try the Early Learning Bundle at the Build Your Bundle Homeschool Sale. It’s geared specifically towards the little ones, with coloring sheets, play dough mats, and other age-appropriate activities to guide you. 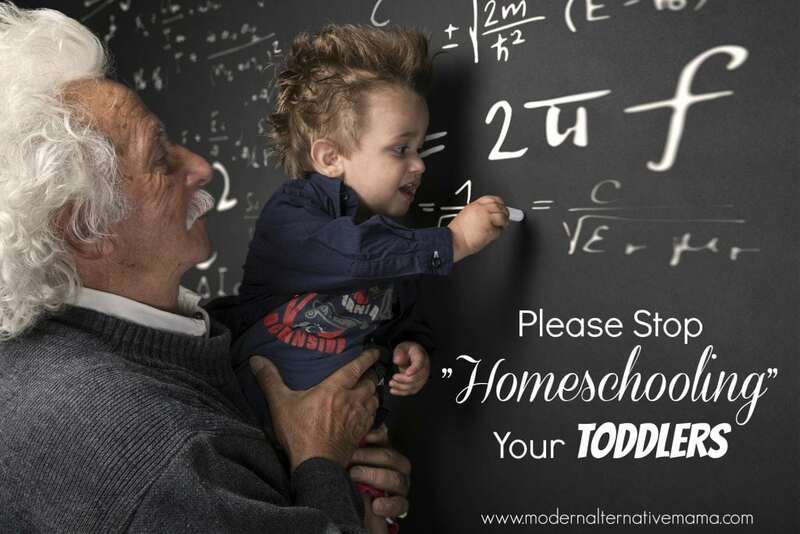 Do you believe in homeschooling your toddlers? I will be using Heart of Dakota’s Little Hands to Heaven with my 3.5 year old in the fall…ONLY because he asked me sadly when he gets to have school. Having two older brothers who are homeschooled has made him eager to join in. He has always had access to many of the activities listed in this post. If he hadn’t specifically asked, I would be more than happy not to. Thankfully, LHTH is very gentle, and full of hands on, sensory, and motor activities. I wonder if moms of more than one notice this inclination in their toddlers? In the defence of many I think a huge problem lays in the term ‘school’. We did tot-school before my little one turned 2, and yes he’s now 2.5 and knows his letters and numbers and such but… EVERY TIME.. the moment his interest was lost we stopped. We hung our activities on a letter a week, but those activities were play dough, and paint stampers, and scribble colouring, and sensory objects, and things that made noises… It felt like school at moments, but your list of alternatives pretty much sums up 80+% of our activities. I agree you shouldn’t be teaching toddlers decoding words and addition but just sometimes calling something school and needing a plan is the motivation mummies require to get round to some of those activities that need just a bit of prep! Yes yes yes! I have a 2.5 year old daughter, and a lot of friends with similar ages are pushing preschool and such. But you know what? My kiddo learned her ABCs and their sounds a year ago by pointing to signs and asking about the letters. She has taught herself several sight words from us reading together (not my doing, I prefer phonics, haha). Even stuff I do by myself in front of her makes a difference; she has memorized quite a bit of Scripture from hearing me recite my memory verses throughout the day, and even knows some Japanese kana and kanji from watching me review. If a toddler is ready to learn something, you don’t need flashcards to teach them. We have seven kids. We pushed school on the older ones and fought them. It was sad and they cried during reading and became frustrated during math. They needed to build a foundation for learning. Play with butterflies, watch ants, climb trees, bake cookies, build towers, then when you start teaching about the details behind all these things…biology, physics, chemistry, they are ready and fascinated instead of just trying to please a parent worried about looking bad around other school pushers. My younger kids are a lot happier and they picked up reading and math at an older age, much faster and without the fight. Also, I believe that some of the problems surrounding generations of video game addicts, among other serious issues, can be traced back to very young education. They aren’t able to be creative and imaginative as often and when you miss or cut short certain stages of development, an immature person may revert back to those stages as an adult and it can take the form of addiction. I’m glad you’re bold enough to speak out about controversial topics. There’s a lot of shepherding from social media, governments and news that push agendas; and a lot of believers. Love this! I’ve been homeschooling for 12 years now, and couldn’t agree more!!! It breaks my heart when I hear/see mom’s pushing their little’s to learn things and do things that are not developmentally appropriate! Colors/ shapes are important to teach. Letters can be taught while reading. Richard Scarry books are wonderful for these. In schools now, in kinder, kids need to know their letters because they are expected to read by the end of K.